Do you suffer from ‘hoarding disorder’, or do you know someone who does? An estimated 1-3% of Australians suffer from this disorder, which equates to as many as 400,000 people. As the scope of the problem becomes more apparent, more initiatives are being put in place to assist with treating individuals who suffer from this crippling condition. Once upon a time hoarders were considered to be dirty, lazy individuals who just loved to collect stuff. Nowadays, hoarding is recognised as a severe mental health issue that comes with myriad health and safety concerns. 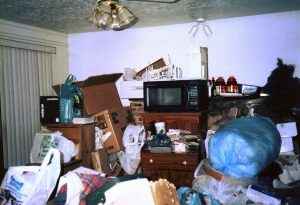 Known as hoarding disorder, compulsive hoarding occurs when an individual collects a large amount of items that appear to be useless or of limited value. The rooms where hoarders live often become so cluttered that they can no longer be used for the purpose they were originally intended for. For instance, an Australian woman who suffered from hoarding disorder resorted to using a kitty litter tray as a toilet because she could no longer access her bathroom. While the items hoarders collect do vary, the collection of rubbish is the most common. This often includes newspapers, magazines, junk mail, old receipts, food wrappers and containers. What are the Risks Associated with Hoarding? In 2012 a five-year-old Melbourne boy died after he cut his foot on an open can of dog food in his family home. Several days passed before the boy’s mother raced him to a nearby ambulance office after the wound had become infected and the child had stopped breathing. The paramedics were unable to revive him. It was later revealed that the parent’s home was littered with rubbish, toys, broken furniture, spoiled food, empty bottles and faecal matter. The boy’s parents pleaded guilty to criminal charges for the risks they had exposed their child to. This example may sound a little extreme, however, hoarding can have some serious health and safety repercussions that affect sufferers and their families. The homes of people living with hoarding disorder are hazardous, as clutter quickly becomes a fire hazard, especially when doorways and windows are blocked. Falls and injuries, sometimes even death, are also more prevalent among hoarders, as it’s easy for them to trip and for objects to fall on them. Hoarding isn’t only detrimental to people’s physical safety; it also plays a toll on their emotional wellbeing. Most hoarders are uncomfortable having people enter their homes, which severely limits their social interactions, and the stress and concern caused by hoarders often takes a toll on their loved ones. If that wasn’t already enough, there have been countless cases in Australia where an individuals hoarding has become so bad their houses have been repossessed to cover the costs of a large-scale clean up. What’s Being Done to Tackle the Prevalence of Hoarding Disorder? Sadly, there’s no short-term solution to hoarding disorder. While cleaning up a house might eliminate the immediate threat, hoarding disorder is a mental health issue that requires long-term treatment. One approach is Cognitive Behavioural Therapy. When undergoing therapy the individual is taught to see the objects around them in a new light, eliminating their unhealthy attachment to rubbish. When the time does come to clean out their property, hiring a skip bin – or two – will be a worthwhile investment. This will likely be a distressing time for everyone involved, but with the correct waste management assistance, the process will be streamlined, so your loved one can start healing in a safer, more spacious home. If you’re looking at hiring a skip bin for your waste disposal needs, contact Perth Bin Hire today.